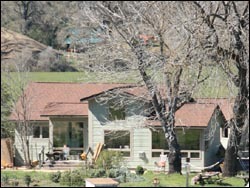 This passive solar remodel of a 1930’s farm house in rural Lake County, California, incorporates a direct gain passive solar heating and cooling, natural day-lighting, and re-orienting space to move living areas south and sleeping and bathing areas north…while expanding the house footprint by only 300 square feet. 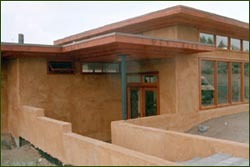 This new, off-grid passive solar home (featured in our banner) is a modern reproduction of a Frank Lloyd Wright Usonian house, incorporating direct gain passive solar heating and cooling, natural daylighting, solar water heating and expansive views. Given the four-mile driveway to this remote site, an off-grid photovoltaic solar system was far less expensive than hooking up to the power lines. 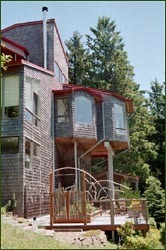 This new, passive solar home on rugged Neahkahnie Mountain includes an office wing for the couple’s publishing business, incorporates natural daylighting and sweeping views of the Pacific Ocean and northern Oregon coastline. 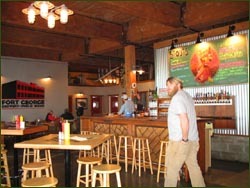 The Fort George Brewery and Blue Scorcher Bakery are two new businesses incorporated in the main floor of this adaptive re-use of a former automotive repair facility. Plans include developing a second story residential use for the building’s owner/developer and his family. 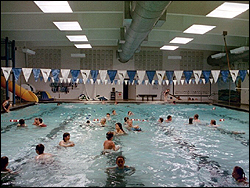 This million-dollar remodel and expansion of the existing pool building included retrofitted daylighting systems in the natatorium, new reception area and locker rooms. Past projects for the district include an administrative wing and the Seaside Youth Center in collaboration with the City of Seaside.